The Uzbek government has forced over one million people into cotton picking during the 2014 harvest, according to a damning report released by a German-based rights group. 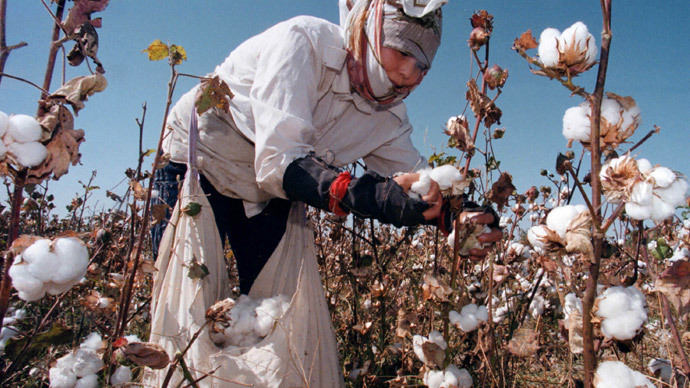 Thereport, released Monday by the Uzbek-German Forum for Human Rights (UGF), says that the government’s program of “mass extortion” and “forced mobilization of labor to harvest cotton” reached unprecedented highs during last year’s harvest. Government officials siphon off much of the profits from cotton production, which the UGF estimates amounts to some $1 billion a year. “At all levels of government, officials take their cut, and Uzbek citizens...are forced to pay or pick cotton through intimidation and fear,” Umida Niyazova, UGF's director said. “The scope of the bribery is simply astounding”. The increased number of public services workers was intended to compensate for the decreased number of children being forced to pick cotton. Until 2012 when Tashkent officially banned the use of child labor following an international outcry, the Uzbek government routinely put children to work in the fields. The Uzbek government has denied the state-sponsored use of forced labor for the harvest. The 2014 Global Slavery Index however ranked Uzbekistan second only to Mauritania for prevalence of slavery. The report notes that at least 17 people died and numerous others were injured during the harvest due to unsafe working and living conditions. President Islam Karimov was inaugurated for a fourth term last week, despite a constitutional restriction limiting presidents to just two terms in office. Karimov has served as the country’s ruler since before the dissolution of the Soviet Union. His rule has been characterized by brutal crackdowns on political opposition, election rigging, and violations of the constitution.